Example of a disabled access minivan with a passenger-side access ramp access that is blocked by a sedan parked illegally in the required access aisle. Photo credit: United Spinal Association. If you have wondered about the purpose of those blue diagonal-lined areas adjacent to, or between, accessible parking spaces for drivers with disabilities, they are there for a number of important reasons. The United Spinal Association, a national membership organization for individuals of all ages with spinal cord injuries or disorders, urges summer vacation travelers to steer clear of these "access aisles" because parking unlawfully in them can compromise safe use of accessible parking spaces. 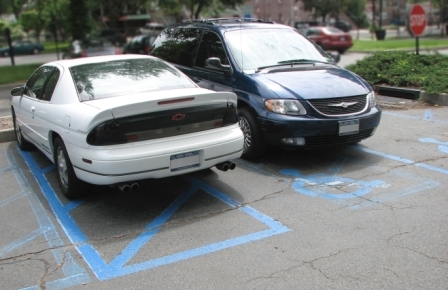 Since enactment of the 1990 Americans with Disabilities Act, accessible parking spaces must have access aisles, and two accessible parking spaces can share a common access aisle. In many cases, the access aisle is 60 inches wide minimum—not nearly enough space to squeeze in an additional vehicle. 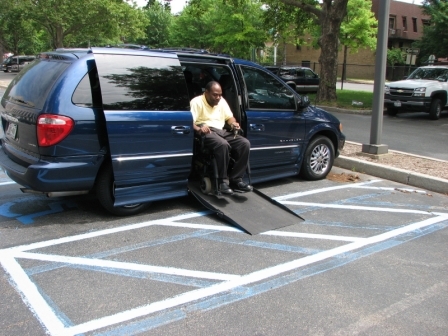 However, the Americans with Disabilities Act added a provision that one in every eight accessible spaces, but not less than one, must be served by an access aisle that is 96 inches wide minimum, so that drivers with disabilities using vans or minivans equipped with side-loading lifts or ramps would have enough space to exit/enter their vehicle safely. These 96-inch wide access aisles have become more the norm since 1990. Although parking in a 96-inch wide access aisle is illegal, it is used all too often as just another parking space. In addition, a blocked access aisle of any size can make it unsafe for a wheelchair user, a scooter user, or anyone with impaired mobility to transfer to and from their vehicle. The parking access aisle is also part of the disabled driver's accessible "path of travel" to the building or facility served by the parking area; block the access aisle illegally with your vehicle, and you prevent the driver with a disability from living their life to the fullest. Jerome Kleckley of New City, New York, exits his van easily to an access aisle. Kleckley reports numerous occasions when he has returned to his van to find access to it blocked by an unlawfully parked vehicle. Want to help, or to become an advocate for drivers with disabilities? Download the PDF from https://www.unitedspinal.org/pdf/parkingpad.pdf to print out a flyer(s) which can be placed under the windshield wiper of access aisle blockers as a simple reminder of why accessible parking spaces and adjoining access aisles are the law of the land.